A weekly newspaper has published a ‘world exclusive’ story about a new exhibition by renowned artist Banksy. The Weston, Worle & Somerset Mercury featured the news on the front page of today’s paper and has also struck a deal with organisers to give away all 1,000 tickets for the show’s opening to readers. There has been much media speculation this week that the anonymous guerrilla artist was preparing to launch a new installation in Weston-super-Mare’s disused seafront swimming pool the Tropicana. But the Archant weekly was the first to publish the full facts, confirming details of the six-week exhibition and featuring exclusive quotes from Banksy, along with pictures of some of the artworks. The Dismaland exhibition, which is a Disneyland satire, will feature the work of more than 50 artists from 17 different countries, such as Damien Hirst, Jenny Holzer and Jimmy Cauty, while it will also include 10 new pieces from Banksy himself. The newspaper’s deal will ensure that all 1,000 tickets for the opening event tomorrow are given away free with a voucher printed in this week’s edition. The voucher can then be exchanged for a wristband on a first come, first served basis from a Mercury-branded beach hut from 9am tomorrow. 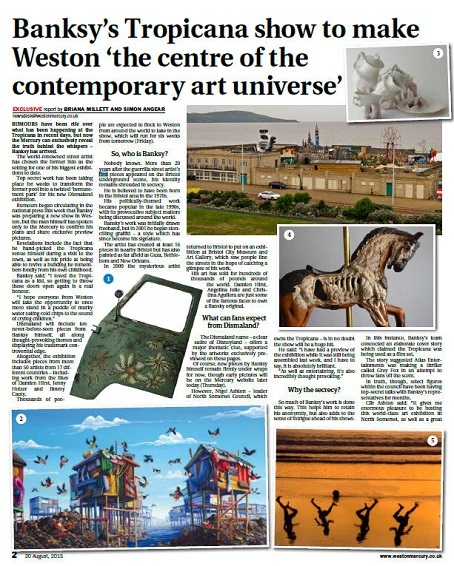 Simon Angear, group editor of Archant’s Somerset newspapers, said: “There can be few contemporary artists as widely known around the world as Banksy, and it’s an enormous coup for Weston-super-Mare that he’s chosen the town to host his new exhibition. “From what we’ve seen and heard, Dismaland looks set to be his most provocative and controversial work yet, and I have no doubt the eyes of the world’s art-lovers will be on Weston over the coming weeks. “Banksy’s team could not have been more helpful and accommodating as we have planned our coverage, and the exclusive locals-only launch – an idea which came from Banksy himself – has been the icing on the cake, and is brilliant news for our readers. Archant Print has also been involved in printing 20,000 copies of the official programme for the exhibition. 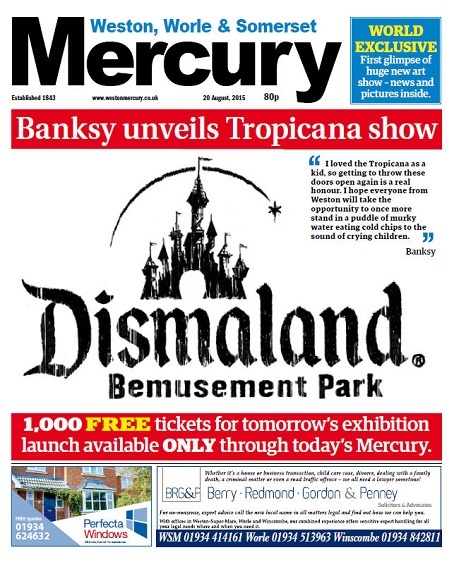 Banksy told the Mercury: “I loved the Tropicana as a kid, so getting to throw these doors open again is a real honour. so they gave a genuine world exclusive with a global star with a free giveaway for 1000 readers and a chance to engage with non-readers just one inside page! Cracking story. Well done to those involved. Well done the Mercury and Banksy – somehow I didn’t think Hello! was going to get the gig.